Start your mornings feeling clean and confident all day with the gynaecologist and dermatologist approved St. Botanica Feminine Intimate Hygiene Wash. Regular soap and body washes aren't specially formulated for your external vaginal area, and can cause itching, dryness or irritation. Try switching from bar soap or regular body wash to a pH? 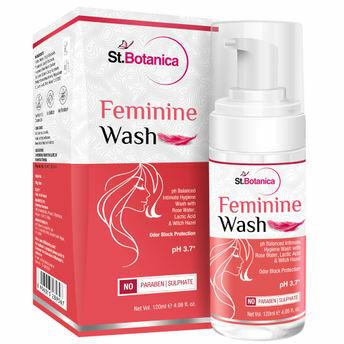 balanced feminine wash like St.Botanica. A pH number (0-14) measures how acidic or alkaline something is. St.Botanica pH-balanced Feminine wash is specifically formulated to be in harmony with the natural pH-balance of your feminine area. It has a 3.7 pH level and Odour Block protection that helps prevent foul odour. Explore the entire range of Intimate Hygiene available on Nykaa. Shop more St.Botanica products here.You can browse through the complete world of St.Botanica Intimate Hygiene .